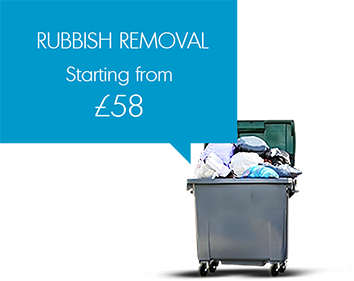 When you need rubbish removal in London, simply call us, and we will arrange you an appointment with an experienced rubbish removal team. When the team arrives on site will evaluate the volume and the weight of the rubbish to collect and will estimate a final price and collect the junk straight away for you. We can deal with a wide variety of rubbish such as after-builders debris, backyard waste, office waste, all sorts of domestic waste and many more. The rubbish collection teams will take care of your commercial or residential waste in a timely, professional and ethical way. We are eco-friendly and we can take all types of waste (apart from hazardous waste and medical equipment) – discarded furniture and electrical appliances, household and garden waste, refurbishment waste, office equipment etc. Give us a call anytime and our friendly staff will help you through the booking process or any questions you might have. The London-based waste collectors can pick up the refuse from your property, office, garden, garage or shed, all they need is access to it. We always provide you with a no-obligation quote before we proceed with the service. After we have collected the rubbish we will transport it to a safe disposal center. 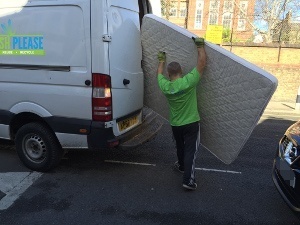 Rely on us for prompt and efficient rubbish removal, anywhere in the M25 area of London. 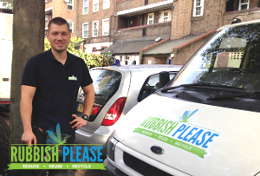 Rubbish Please provides the junk collection services any London resident requires - fast, reliant and with competitive pricing. Forget the slow and tedious local council waste collection and choose a company which has the sole purpose of providing its clients the best service. 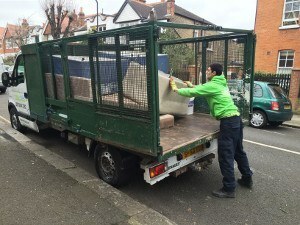 The waste clearance service we offer you in London is cheaper than hiring a skip and involve much less hassle than dealing with your local council. Take note that you’ll only pay for the actual amount of junk that we dispose of. Need us urgently? Same-day rubbish clearance services are available where possible. Step 1: Contact us and provide a description or picture of the waste that you need to be removed. You can reach us 24/7 on 020 3404 5556 or via e­mail. Step 2: Based on the volume, weight, and type of your rubbish we’ll calculate an approximate estimate for you. Step 3: We will set a date and time suitable for you. We can assist you on weekends and during evening hours! Step 4: A rubbish removal team will come to your property, evaluate the waste, and provide a final quote. Please note that this estimate includes the cost of labor, transportation, and disposal. Step 5: If you agree to the price our team will take your rubbish there and then. When you choose Rubbish Please you’re hiring a rubbish removal company that’s been operating in the waste management industry for over 10 years. We are fully insured and approved by the UK government – our waste removal services are used by many customers for both domestic and commercial purposes in and around London. So, don’t hesitate to call 020 3404 5556 to arrange your rubbish collection appointment today! The reprocessing of already used materials into new products in order to reduce the usage of raw materials. It's purpose is to prevent the waste of resources, reduce air and water pollution and decrease greenhouse gas emissions. The complete flow of waste from domestic or industrial areas through to final disposal. Waste materials from factories, markets, restaurants, pubs, offices, warehouses, hotels and other wholesale or retail establishments. A person employed by a private company or a local council to dispose of waste from households, businesses and bins. E-waste is discarded electronic devices such as computers, TVs, microwaves and other electrical appliances. This type of waste is also known as Waste Electrical and Electronic Equipment (WEEE). A typical place to dispose of rubbish and refuse. Waste is buried in excavated pits which are usually covered with soil or special fabric cover. This method is considered safe for the environment. Known as refuse or rubbish in the UK. Consists of unwanted items thrown away by the public on daily basis. The illegal disposal of waste on land not certified to store and/or receive it. Household appliances such as ovens and fridges, as well as unwanted furniture and other large refuse that can't be handled by the regular Municipal Solid Waste (MSW) processing methods.